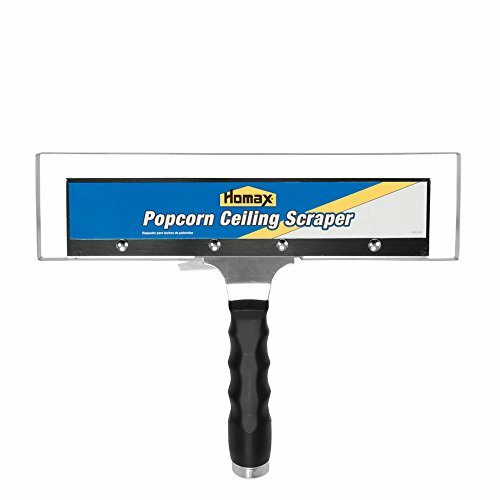 Homax Popcorn Ceiling Scraper is a specially designed scraping tool that removes unwanted popcorn ceiling texture. It features a unique bag attachment captures texture as it is removed, so the texture falls into a bag…not on the floor. Designed to protect and prevent ceiling from gouges. It has a 12 inch blade. Simply connect the Ceiling Scraper to any standard extension handle. A typical 10' x 10' ceiling can be completed in 30 minutes or less. If you have any questions about this product by Homax, contact us by completing and submitting the form below. If you are looking for a specif part number, please include it with your message.